Municipal finance chiefs face bankruptcy, a history of bad decisions. Municipal finance chiefs are fighting to keep their troubled cities solvent. Sometimes it’s a losing battle. Prior to its incorporation in 1850, Stockton, Calif., was known as Fat City, and later Mudville. Prophetically, its financial fortunes followed this progression in names from boom to bust. Stockton filed for bankruptcy in 2012, and until Detroit went bankrupt earlier this year, it had the dubious distinction of being the largest city in the country to seek Chapter 9 protection. The cities are two of 12 other municipalities that have petitioned for bankruptcy protection since 2008, among them Jefferson County, Alabama; Harrisburg, Pennsylvania; and Vallejo, California. Eight of these filings occurred in the last three years. To be sure, the Great Recession was a big factor in these bankruptcies, but it wasn’t the smoking gun. The fiscal distress plaguing dozens if not hundreds of municipalities nationwide are hinged to past sins, and today their finance managers are desperately trying to set them on a straight and fiscally responsible path. Take Stockton, which city manager Bob Deis calls “a cautionary tale.” Brimming with property-tax revenues in the early 2000s, the city issued millions of dollars in bonds to build a marina and the 12,000-seat Stockton Arena. The booming stock market bolstered city pension funds, giving it the confidence to provide high-paying salaries and free health care for life to city workers. (One month on the job as a courthouse janitor and free health insurance was guaranteed for life — to the spouse, too.) Money flowed into multiple projects to rebuild the downtown core and spruce up the riverfront. That’s how bad things are for many municipalities — trim one more cop off the force and it’s the Wild West. For cities like Detroit, with its $18 billion in debt, the fiscal fissures are too deep to patch. Half the population is gone in a generation, their tax dollars in some other municipality’s coffers. U.S. cities, counties and states can learn volumes from what went wrong in places like Stockton and Detroit. Chief among the lessons is the need for municipal finance leaders — CFOs, controllers and comptrollers — to stand up and be counted. 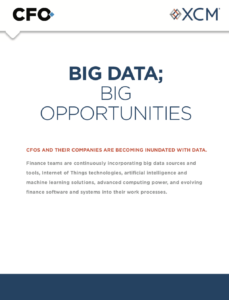 “It takes a CFO to say, ‘Wait a second. Let’s get an actuary to cost these things out and see where we’re going before we dive in,’” says Deis. She e-mailed some figures indicating that the city had budgeted $19 million for property taxes and $13.9 million for sales taxes in fiscal year 2007/08. Together, the revenue accounts for nearly 40% of the budget. When the dollars were counted at year-end, they were short by more than $5.2 million. Meanwhile, revenues are starting to improve slightly. “We were able to get the voters to approve an additional 1 percent of sales tax, translating into $11 million that we didn’t have before,” says Lauchner. “And best of all, bankruptcy has allowed us to restructure our debt obligations. 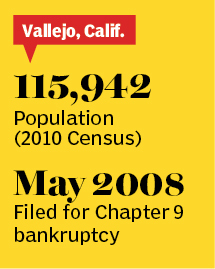 We’re able to make the debt-service payments.” Other advantages of Chapter 9 for Vallejo have included the ability to eliminate binding arbitration and minimum staffing levels in union contracts — “the stuff that’s never positive for a city, because you usually lose,” says Lauchner. Dan Miller, controller of Pennsylvania’s capital city of Harrisburg, can relate to Lauchner’s experiences, although the outcome in his case isn’t what he had hoped for. He and other city leaders filed for bankruptcy protection in 2011, only to have a federal judge dismiss their petition. Miller is convinced bankruptcy is inevitable. Harrisburg first defaulted on the 2002-era Series A bonds backing the incinerator, and then defaulted on its general obligation bonds, which Miller says run about $12 million a year. As if these fiscal woes aren’t bad enough, the city confronts $180 million in unfunded health-care liabilities. “We need to be putting away $15 million to $18 million a year to fund these liabilities, but we can’t afford to,” Miller says. 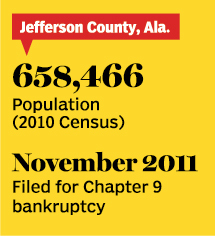 Bankruptcy was the only option left for Jefferson County, Ala., which filed for bankruptcy in November 2011, following the collapse of an agreement between county officials and investors to refinance $3.1 billion in sewer bonds. Like other municipalities under water, Jefferson County first slashed payrolls, facilities and services to make up for the budget shortfall, but the actions failed to stanch the red ink. Jefferson County’s problems were unique. Unlike Detroit, Vallejo and Stockton, it does not have any union contracts (Alabama has a “right to work” law prohibiting agreements between labor unions and employers). Also, the county’s statutory pension program for public workers is fully funded. Rather, a massive, unanticipated tax revenue shortfall combined with more than $3 billion in sewer-related debts brought it to its knees. One can argue that there are always options to avoid bankruptcy. But when there is no money left in the till to service outstanding debts or pay for ongoing operations, a city can’t print money like the federal government — something has to give. Chapter 9 does just that. It gives municipalities needed freedom from creditors and union contracts until a repayment plan between the parties is created to resolve outstanding debts and contractual issues. While Pagano argues that Chapter 9 should always be a last resort, he believes that Detroit, Stockton, Vallejo and other municipalities had no recourse — not that he lets them off the hook for their financial messes. “Detroit operated in denial for decades, failing to diversify its economic base even though it was apparent that the Big Three automakers that put it on the map were pulling back,” he says. Is bankruptcy the best solution for troubled cities? It’s too soon in Detroit, Stockton, Vallejo and Jefferson County to conclude that the patient is healed. But when all other options are exhausted, the answer would seem to be yes. Still, cities must carefully weigh the risks of bankruptcy. It can tarnish a municipality’s reputation, steering businesses in other directions. It also affects the ability to attract bond investors, potentially scaring them away for good. “I wish we could go back and ask Moody’s, Standard & Poor’s and the other rating agencies why they gave AAA credit to these places years ago, when they were making these risky promises and deals,” Pagano muses. Russ Banham is a contributing editor of CFO. Overwhelmed by huge budget deficits when the recession struck, cities like San Francisco, San Jose, Calif., and Joliet, Ill., looked bankruptcy in the eye and passed on the opportunity, preferring to find other ways of addressing their ongoing financial liabilities and declining tax revenues. If these injuries weren’t bad enough, the county’s pension fund bled dollars in the recessionary environment, migrating from fully funded status in 2007 to 64 percent funded two years later — a $2 billion shortfall on a market-value basis. San Jose also took a punch to the gut: 10 straight years of budget deficits through 2013. City leaders were forced to continually cut services, shrink the workforce, close libraries and community centers and ask everyone from the mayor on down to take pay cuts. In fiscal year 2011-12, the budget gap was an eye-opening $100 million, for a general fund that typically runs about $900 million. “Our expenses skyrocketed from $72 million to $277 million in the course of a decade [through 2013],” says mayor Chuck Reed. Each of these municipalities suddenly confronted their worst nightmares. Being prudent fiduciaries, they weighed the advantages and risks of declaring bankruptcy but put it on the back burner. In the meantime, they got to work. San Bernardino County took a different tack, issuing $37 million in debt to help plug its budget gap. 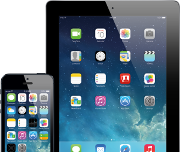 It also reduced annual energy expenses, leveraging an energy incentive program offered by a local utility to retrofit county buildings, and successfully renegotiated labor contracts with county unions. “Employees are now picking up a larger share of the pension plan, and we’re now moving toward more cafeteria-style benefits,” McBride says. Joliet, too, is climbing back up. “Anything viewed as discretionary spending was cut,” says Thanas. “For example, our neighborhood improvement program, which has been around since the 1980s, had grown to the point where each of the five council members had between $1 million and $1.5 million to spend on new parks or road improvements. We made some steep cuts there, recommended a hiring freeze and implemented an early-retirement incentive program.” The city did not replace employees who chose early retirement. The various actions ultimately paid off: “We went from a peak of $37 million in gaming revenue to less than $20 million when the recession hit, and have since been able to make up the shortfall entirely through these measures,” Thanas says. — R.B. I was the city manager in 2008 that recommended BK for Vallejo. We had no choice; the city ran out of money to pay for union contracts. The city labor unions were stupid and they could not comprehend the math involved in operating a city. Basically, the math goes something like this: The fire union charged their members $175.00 month x 12 months/year x 100 fire fighters x 2 ( election cycle every 2 years) = $410,000. Police union charged $125 per month x 12 months/year x 145 cops x 2 years (election cycle once every two years) = $435,000. Together these two unions bought their elected Council members every 2 years since they financed the local elections by the tune of $$845,000 for every election. No one could compete with the fund raising. They controlled the City Council, their own contracts and the rest of the city too. Hence, their contracts were not sustainable and bankruptcy was the result. The Fire and Police union cooked their own “petard” as the saying goes. A couple of comments related to the County of San Bernardino: the County did not borrow $37M to help solve its budget problem, it actually prepaid $37M in debt using one-time funds to generate ongoing savings to help bring the budget in line. Second, the County is moving away from cafeteria style benefit plans, which are pensionable in our system and thus cost substantially more. These types of actions, combined with cooperation from employee bargaining groups and an elected Board willing to make difficult financial decisions in a timely manner have allowed the County to continue to adopt structurally balanced budgets throughout the economic downturn.